Many guys really love the chinos that J Crew makes, and with their recent price cuts, they are more enticing than ever. This is not to mention the fact that J Crew recently introduced a new fit for their chinos called the 770. But first, some much needed background. The 484 fit, which is their slimmest, and for many, borders on skinny. It’s slim throughout the thigh and calf, and had a nice, but not super aggressive, taper. This is my preferred fit, and it fits me just about perfectly (when their sizing is not inconsistent, which it increasingly is). The 1040 Athletic fit, which is roomier in both the upper and lower leg. The 1450 Relaxed fit, which is roomy throughout, and not really recommended for most. This spectrum of fits worked for most guys, but J Crew noticed that there was definitely a large contingent of guys that were not skinny enough to find the 484 fit flattering, but also found the 1040 fit too roomy. Thus, any guy that was not full on, super athletically built, nor super slim, found no chinos at J Crew that would fit him. What’s a guy like that to do? Well, J Crew’s answer to that is their new 770 fit, which promises to fall perfectly between the 484 and 1040 fit, with a bit more room in the thigh area, and a nice, but not as aggressive as the 484, taper in the lower leg. But, in reality, what is really the difference? How do these two fits actually compare? Other than rough guidelines on their site, J Crew does not provide too much more information. So, we ordered the exact same pant, in the exact same size, in both he 484 fit and the new 770 fit to bring you all the precise differences and measurements between the two. For this review we went with the reviewer’s usual size 29x32 in J Crew chinos in their stretch chino in the color “Faded Chino.” It’s a nice, classic, versatile and timeless color that goes with just about anything. Upon first trying them on, we noticed that the fits were very, very close to being identical. You would have thought that there would have been more noticeable a difference, but there hardly was. Both the 484 fit and the 770 fit pants fit quite similarly. There is a slight amount more fabric in the thigh area in the 770 fit, true, but it’s really only noticeable that these are two different cuts in the lower leg, specifically in the knee area, and a bit below. And even there it’s not really all that noticeable until you look closer. The leg opening itself is almost exactly the same, though the lower leg in the 770 fit is overall roomier, even if it tapers to almost the same opening. To summarize, then, the 770 does have a bit more room in the upper leg, and a bit more room still in the lower leg. However, it’s not that much of a difference. What this means is that if you find the 484 fit just a bit too tight, then this 770 fit truly is perfect for you. If you need a bunch more room, then the 1040 fit is likely your best bet. 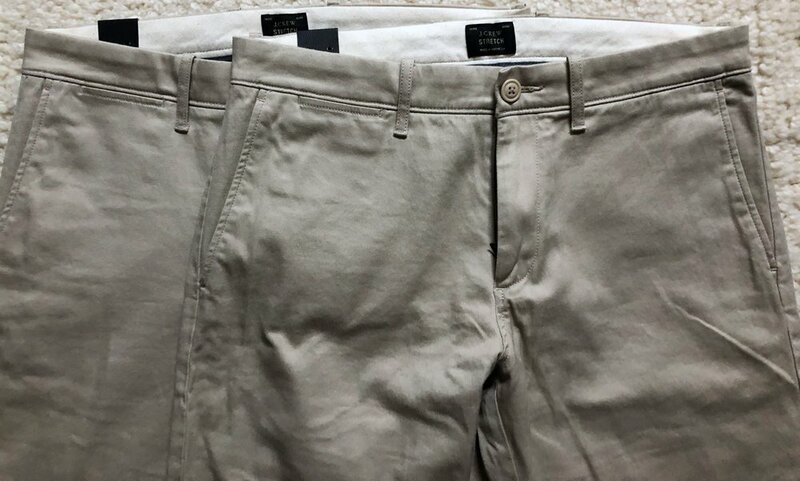 J Crew 770 Fit stretch chino — $68: J Crew makes real good chinos. It’s sort of their bread and butter. Even at full retail they are a solid deal, but considering they are almost always on some sort of sale, they are absolutely worth the money. With the recent additions to their fits, there is now a J Crew chino for most anyone. However, there is one big caveat to all of this, and that is the fact that their sizing and fit is far, far too inconsistent to recommend them without hesitation or this reservation. I will sometimes have to order two or three of the same chino in the same size and color just to get the right fit that I know and love from my old pairs. This is beyond unacceptable. If you are willing to mess around a bit with your order, and are willing to work a bit to find a pair that suits you, then J Crew chinos are really all they’re cracked up to be. They’re well made, last a stupid long time, and (can) fit really well. If you want a chino you will know will always fit you exactly the same, and can order blind in the future, we’re not sure we can recommend J Crew for that anymore.